This vintage motorized engine model was the central part of a dealer showroom floor display in the 1970s when Mazda was trying to educate potential car buyers about the unique internal motion and minimal number of moving parts inside the rotary engine. The engine was originally mounted atop a tall display base which was had backlit pictorial displays and was designed educate to hold car sales literature. The original base, was circular, to mount on top of a larger, round base, which was supported by a metal stand. The entire display was approximately 5 feet tall. The engine is FULL SIZE, not a miniaturized scale model. The rotors are yellow plastic. The Rotor housings and center housing appear to be made of wood and some kind of light weight composite material. The rest of the engine moving parts are clear and grey plastic. The 4 spark plugs appear to be real Nippon Denso. The interior lining of the rotor housings is made of a type of silver tape held on by adhesive. 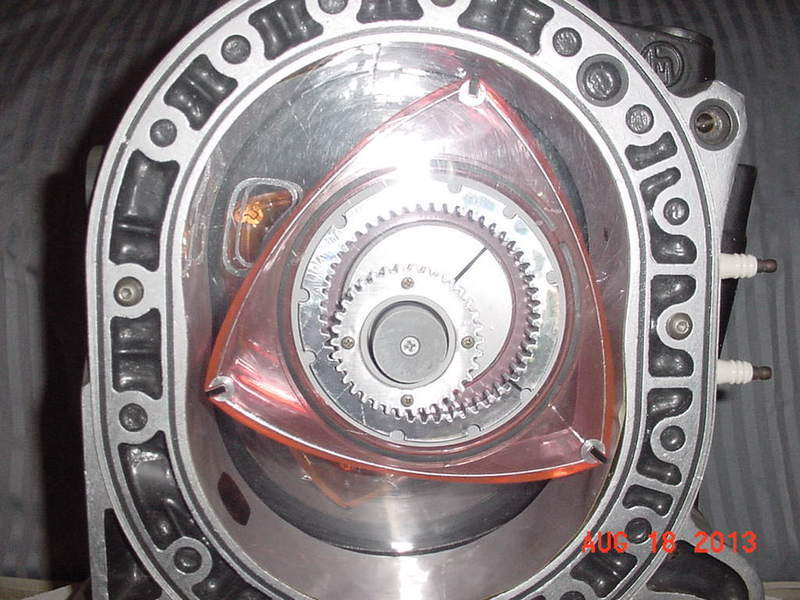 The old adhesive has separated from the rotor housing in a few spots, but the internal rotation is not affected because the apexes of the rotors do not actually have to ride on the rotor housing. This working model is mounted on a wood and Masonite base. The toggle switch on the rear activates the 110 volt electric motor, which drives a small pulley. 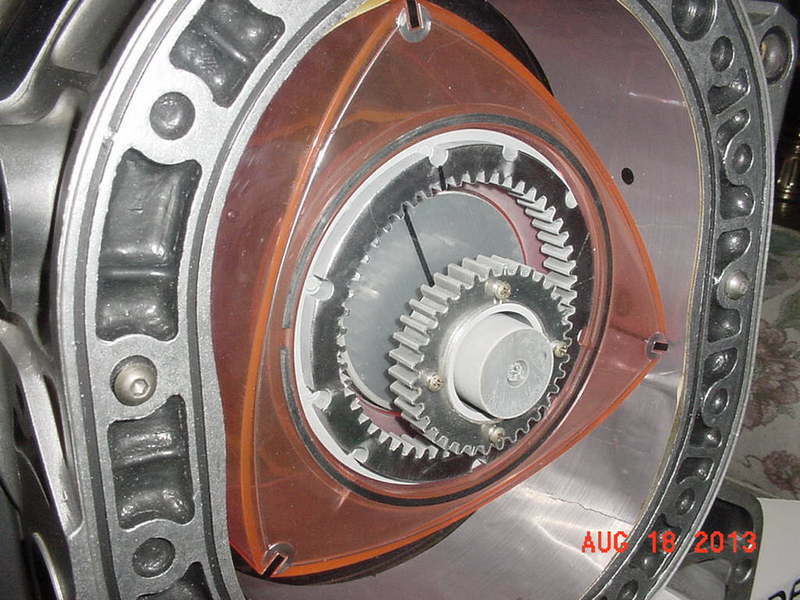 This pulley drives a large clear plastic wheel in the center of the engine by use of a long rubber drive belt. A very long rubber band has replaced original drive belt because it had deteriorated. Two adjustable capstans can increase or reduce the drive belt tension. A low wattage light bulb is on whenever the power cord is plugged in. The light bulb increases the internal visibility of the engine. The entire model can easily be disassembled with a flat blade screwdriver, phillips head screwdriver and one small metric allen wrench. It was partially disassembled today to replace the drive belt and clean the some of the internal surfaces. The cooling fan was for the light bulb, which does generate a little heat. All but one of the cooling fan blades are missing, but the one remaining blade seems to be sufficient to keep it cool. 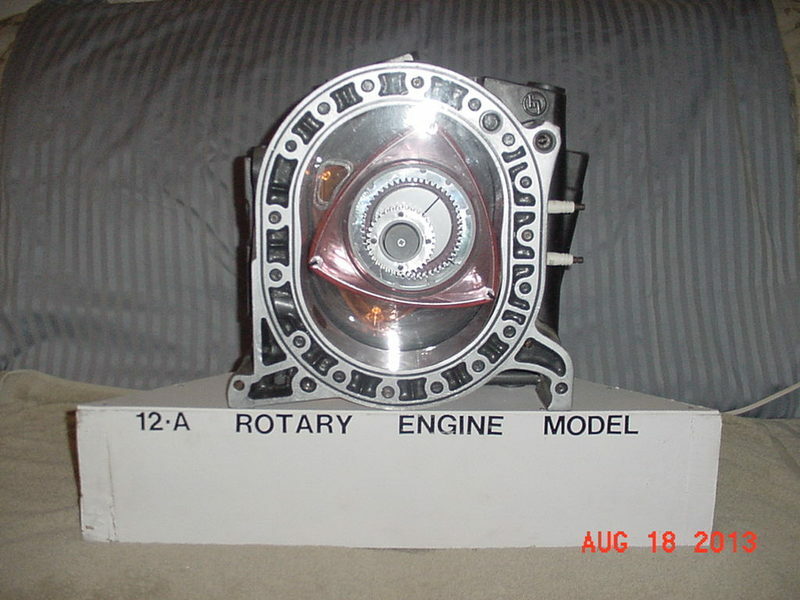 This working rotary engine model was used at an RX-7 Club car show table display. It was amazing how much interest it generated. People are drawn to the motion of the rotors turning inside. 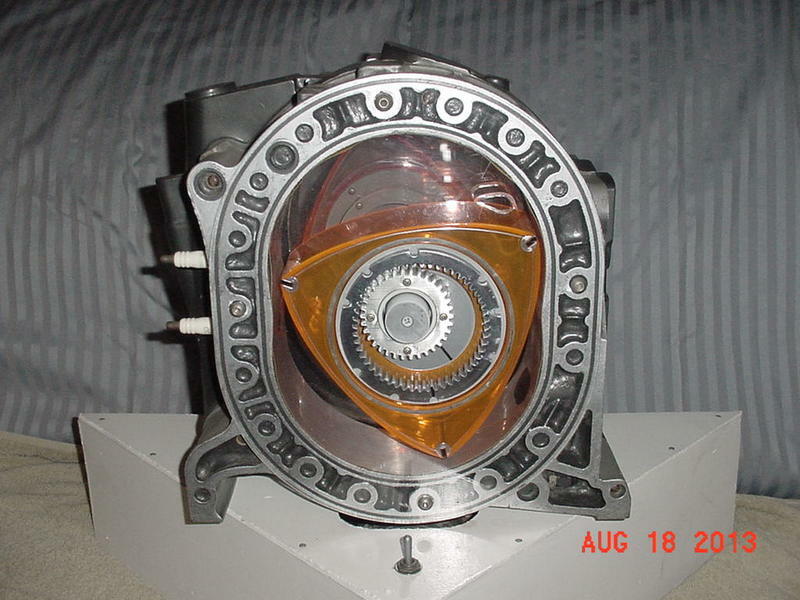 This unique memento of Mazda Rotary engine history would make an excellent counter top display for a business, as well as a great conversation piece at home. There are relatively few dings and scuffs, considering it’s age and that it has never been repainted. It could be disassembled for a paint touch up, but it really is presentable just as it is. Motorized Madness Reaches New Heights!